India is the capital of diabetes in terms of number of patients. In India 4/10 individuals will have deranged sugar control after the age of 40. Many people with diabetes find out their diabetes quite late and by the time this diabetes is diagnosed many of them have advanced complications also. Most common complications of diabetes are related to changes in blood vessels and these changes can affect heart, kidney, brain and peripheral arteries of Limbs. Diabetic foot problem arises from inadequate blood supply to the leg tissues and also affection of nerves that supply foot. As this problem is chronic and requires expert attention we have started services for diabetic foot treatment which will include treatment of diabetic ulcers, non-healing diabetic wounds, gangrenous changes in the foot and joint problems in diabetic foot. We are regularly running diabetic treatment clinics in the form of OPD from 6 to 10 PM on weekdays where diabetic people can get themselves screened for diabetic foot related issues like peripheral vascular disease, diabetic neuropathy and vascular claudication. We educate patients how they can take care of their feet by regularly inspecting them for any cuts or small wounds, which if taken care in right time can prevent further complications. 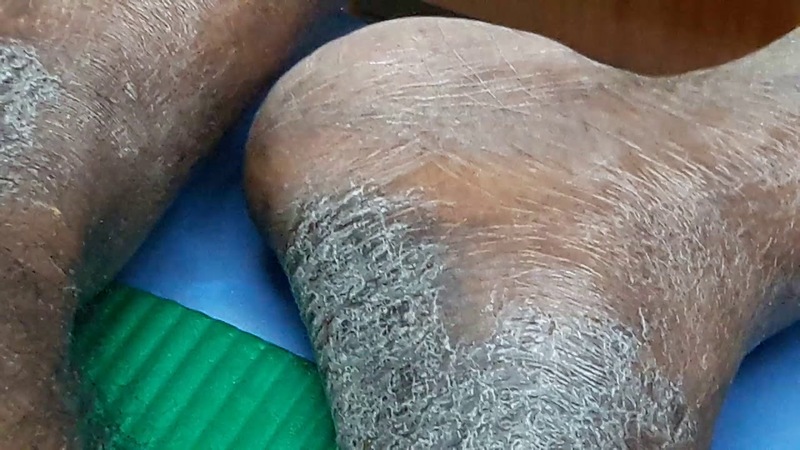 Many times people with diabetes will have deranged sugars because of infection in the legs which can cause cellulitis and can lead to gangrene which sometime can lead to loss of limb. And if not properly attended can cause systemic side-effects like worsening of kidney function and patients can land up in ICU with multiple organ failure. 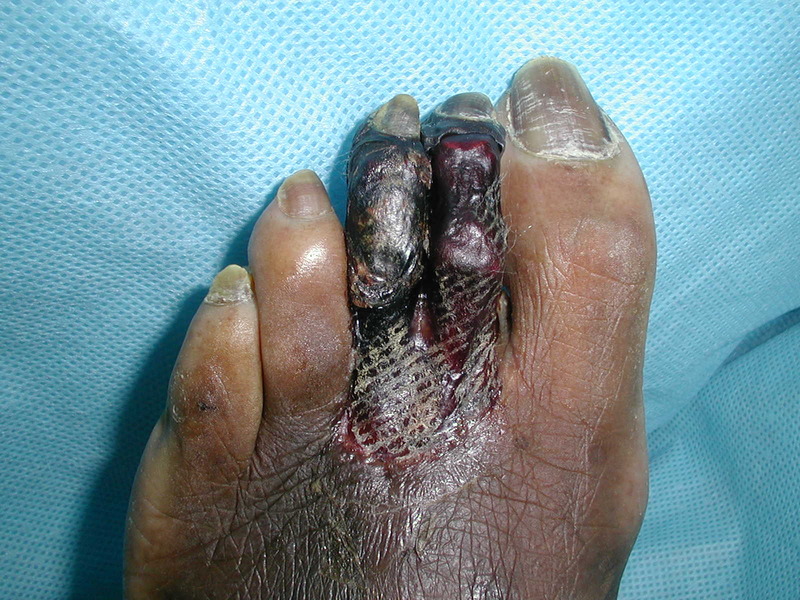 A gangrene would look like burnt and shrivelled tissue and the black colour of skin indicates that the tissue is not viable so there is no chance to save such tissue. Neuropathic ulcers are typically round punched out lesions. These lesions occur because the sensations in the feet are so much reduced that diabetic persons cannot sense harmful or injurious stimuli. Many a times these ulcers are present for longtime before they are brought to medical attention. In this case we encourage and their care givers to regularly inspect patient’s feet so as to find them early. It is also suggested that diabetic persons should wear easily fitting and soft cushioned footwear and also not to walk barefoot. Other skin conditions which are very common in diabetic people are eczema and psoriasis. These conditions are often misdiagnosed and many times patients try to take over-the-counter medications which can worsen the condition as well make it difficult for experts also to diagnose them. So it is encouraged that whenever some abnormal skin changes appear proper skin consultation or diabetologist consultation should be done earliest. As now all sorts of these experts services are available within one centre it will be easier for people to access them and manage their diabetic foot problems easily without much delay. So feel free to contact our services in case you have any such issues. Make sure that diabetic people in your family, are properly attended to and their foot problems are solved in time.